KILZ TRIBUTE Matte is a low VOC, 100% acrylic advanced technology paint and primer in one formulated for superior hide and coverage with exceptional durability and a mildew-resistant finish. Matte sheen offers a subtle, flat finish and resists dirt with a scrubbable film for easy cleaning. Paint-primer in one is ideal for light to dark color changes and covering light to medium stains. A medium-dark greenish gray, Stone Cold has a cool finish true to its name. A versatile hue, Stone Cold works well in spaces with a lot of cool metal finishes and other shades of green and gray. KILZ TRIBUTE Paint comes in four sheens and 100 classic neutrals and on trend colors. Our low-VOC durable and washable long-lasting paints will beautify your home and enhance its livability and value. 1-Gallon can of KILZ TRIBUTE Matte Stone Cold TB-66 Interior Paint for use with high-quality brushes or rollers. Up to 400 sq. ft. per gallon coverage on smooth surfaces. Use on properly prepared coated or uncoated wood, drywall, masonry and cured plaster. Surfaces should be clean and free of dust, grease, chalk, mold, rust and peeling paint. Mix well before using. KILZ has been making premium primers and paints for 40 years and leverage this experience in every gallon of KILZ Paint. Named Paint Brand of the Year in 2015 in the Harris Poll EquiTrend Rankings. Lifetime Limited Warranty (see label for details). GREENGUARD Certified: low emissions of VOCs. Color samples are available in 8 oz. containers or removable Peel & Stick sheets. KILZ TRIBUTE Matte is a low VOC, 100% acrylic advanced technology paint and primer in one formulated for superior hide and coverage with exceptional durability and a mildew-resistant finish. A medium-dark greenish gray, Stone Cold has a cool finish true to its name. A versatile hue, Stone Cold works well in spaces with a lot of cool metal finishes and other shades of green and gray. Matte sheen offers a subtle, flat finish and resists dirt with a scrubbable film for easy cleaning. Paint-primer in one is ideal for light to dark color changes and covering light to medium stains. KILZ TRIBUTE Paint comes in four sheens and 100 classic neutrals and on trend colors. Our low-VOC durable and washable long-lasting paints will beautify your home and enhance its livability and value. 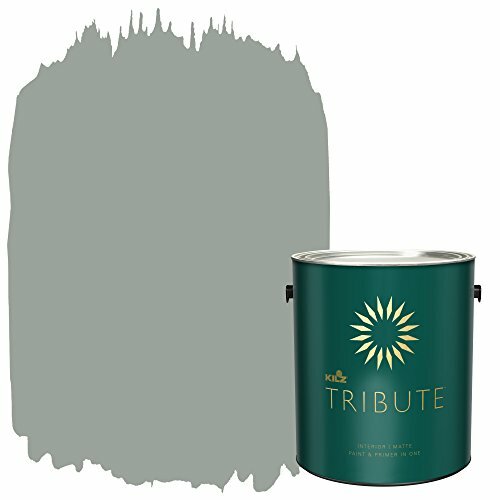 1-Gallon can of KILZ TRIBUTE Matte Stone Cold TB-66 Interior Paint for use with high-quality brushes or rollers. Up to 400 sq. ft. per gallon coverage on smooth surfaces. Use on properly prepared coated or uncoated wood, drywall, masonry and cured plaster. Surfaces should be clean and free of dust, grease, chalk, mold, rust and peeling paint. Mix well before using. KILZ has been making premium primers and paints for 40 years and leverage this experience in every gallon of KILZ Paint. Named Paint Brand of the Year in 2015 in the Harris Poll EquiTrend Rankings. Lifetime Limited Warranty (see label for details). GREENGUARD Certified: low emissions of VOCs. Color samples are available in 8 oz. containers or removable Peel & Stick sheets. If you have any questions about this product by KILZ, contact us by completing and submitting the form below. If you are looking for a specif part number, please include it with your message.